It's about ten thousand degrees Farenheit (actual true temperature) in Boston today and my work hasn't turned on the AC in the building yet, so I'm wilty and a tiny bit surly. Last night I had another fangirl night -- I got to meet author Tara Masih for dinner. Tara wrote Where the Dog Star Never Glows, an amazing collection of short fiction that converted me to short fiction, and that I loved so much, I gave it a shout out in Ladies Home Journal in 2012. It's taken us that long to connect, but I'm so glad we did -- it was wonderful. 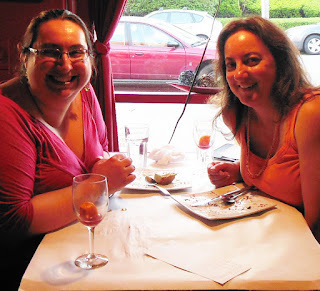 At her suggestion, we tried out this Mexican restaurant I've been dying to go to -- we each had a glass of sangria (much needed, yesterday was nine thousand degrees) and we both opted for dessert (we were delightfully like-minded in many ways!). So, amazing. Makes up for my rather bleh day. But I'm going to the Cape tomorrow with friends to park myself at the beach (it's so hot I may even venture into the always icy Atlantic!). I'm bringing along Jon Steele's The Watchers, Ellen Mansoor Collier's Flappers, Flasks and Foul Play, and Eli Brown's Cinnamon and Gunpowder. Tomorrow I'll be posting about The Paris Wife, the Literary Wives June read. If you've read it, please pop by and chat about it with me -- I've got complicated feelings! What a lovely way to spend an evening, and that sangria sounds might good to me in D.C. right about now! I'll look forward to your post on The Paris Wife; that was certainly a thought-provoking read. It was such fun -- and the sangria was really good. (Wouldn't mind some now either!) Hope you're managing to stay cool this weekend -- can't wait to chat about The Paris Wife. I have all the feels! That is the smile of a truly happy person!!! I think I get that sort of goofy grin when I meet an author at a book signing...I haven't had the pleasure of having dinner with one yet but I have a feeling I would look like I was in the presence of a rock star if I did!!! I'm reading The Perfume Garden by Kate Lord Brown this weekend. Good so far but it's taken some time to get our main character to her Spanish villa!!! Colleen -- that's precisely it -- I was giddy! I don't know what I'm going to do when at the Historical Novel Society conference -- my cheeks my paralyze in my giddy smile! Can't wait for your review of The Perfume Garden -- am very curious about it. Nothing squinty here. All I see if pure happiness! I am reading Life Itself by Roger Ebert and I need to finish In the Garden of Stones by Susan Tekulve. I am never a reacher of trashy books but lately, I really want to read trash! I think my mind is shot until this school year ends. Ti, I know the feeling -- I'm so excited for my big plot-heavy beach reads this weekend! I hope you get to them soon! I'm reading Murder as a Fine Art this weekend and will probably jump into The Paris Wife conversation a little later. Oh, I hope you enjoy MaaFA -- I thought it was soooooooooooo fun! I tried to read "The Paris Wife" but couldn't get into it....though people love it and I suspect I would too if I gave it another chance! I'm reading Deborah Harkness' "Shadow of Night" this weekend! So far I'm able to read it but having v conflicted feelings! Hope you're enjoying Shadow of Night! This looks awesome!!! So glad you wrapped up a hot, wilty day with such fun! It was soooooooooooo worth it! It's perpetual sweating season here in Texas, so I totally get the 10,000 degree thing. Misery. Ugh, I feel ya -- and Boston is so ill-equipped for truly heinous heat -- almost nothing is air-conditioned! I loved The Paris Wife. Have a great weekend on the Cape - I'm jealous as I will be in Boston sweltering. Its cold in Melbourne! Just finished reading the Paris Wife. Full of surprises it was!!! Normally I hate the cold but right now I'm a little envious! Sounds like a wonderful time! I hate heat waves like this, too. So humid! Tomorrow is our library book sale so we've been schlepping boxes of donations around for the past few days. Ugh! Uuuuugh -- I feel for you -- I was packing boxes on Friday -- and in this temperature, it's torture! Hope the book sale went well! Yuck to the heat :( I can't tolerate it! Hi, Audra! Is it OK if I feature this post in an Armchair BEA post of mine today? I want to include your photo with Tara Masih and link it to your post for a virtual meet-the-author. It is -- I just sent an email, Laurie! Can't wait to see it!